Head coach Kingsley Jones says Newport Gwent Dragons will "give it everything" at Edinburgh in Friday's European Challenge Cup semi-final. 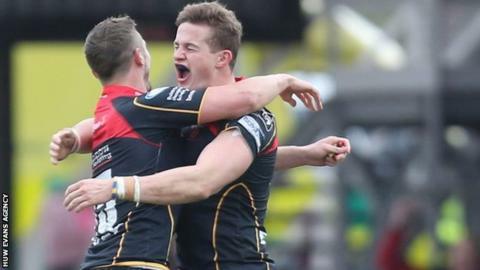 His promise came after Dragons beat Pro12 title holders Leinster on Sunday. "It's fantastic. The players deserve a lot of credit. A bonus point against the champions is beyond our wildest dreams, really," Jones told Scrum V.
He added: "We'll take a lot of confidence from that into this game up in Edinburgh." Dragons were 22-8 down with 30 minutes remaining before fighting back for a stunning win against Leinster. Jones said: "At half time we felt we'd played quite poorly, actually, for about 20 minutes… defending a lot without being able to launch anything and getting any territory or possession. "The second half performance, from a young group of players, just shows the belief and desire. "And the will to come through in the last 15 minutes and get a great win was full testament to the young players." He hopes those factors can take the Dragons to a first final, albeit in Europe's second tier in which they have recorded wins at Stade Francais and Newcastle. The win against Leinster was the Welsh region's fourth consecutive victory in all competitions. "Winning and losing becomes a habit and that's the big challenge here at the Dragons, to turn that mentality around," Jones added. "Beating Stade Francais away really gave us a lot of confidence. "We've come from behind again to get a win against a top side [Leinster]. "We've done well in this tournament. We've done well away from home as well with this group so we'll go there and give it everything." English rivals Gloucester and Exeter contest the other semi-final on Saturday.